A genuinely beautiful and elegant Cycladic property for up to 17 Guests. Located just a few meters from the Lolantonis beach in Paros, Elia is the best ambassador of the Greek Island aesthetics. 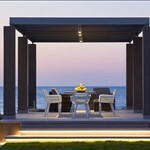 Villa Elia is a new Cycladic property in Paros only a short stroll away from the beautiful white-sand Lolantonis beach. This exquisite and charming beach villa in Paros is situated on a small hill that offers breathtaking views of the nearby sea. Elia villa is actually one compound that contains three independent buildings. This luxury private beach villa in Paros offers a generous amount of common area and is surrounded by lush and beautiful gardens, which makes this location ideal for families with young children. The beach itself is close to Aspro Horio, which is near to Drios. This beautiful hidden gem of white-sand beach is surrounded by only few small houses and a quaint local taverna, which means that you can enjoy a delightful lunch and delicious local wines only a stone's throw away from the beach itself. 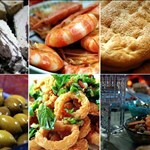 Elia is surrounded by the panoramic scenery of the nearby sea and the famous Cyclades islands. These contemporary villas were built to emulate the local traditional style, which involves bright and airy spaces and terraces for lounging and relaxation. The villas feature an elegant yet reserved decor, each with their own unique elements made by local craftsmen. Each fully independent villa comes equipped with all the luxuries of modern life and can comfortably host 5 to 7 guests each. One of the most popular features of this Aegean villa is the dining area that offers views of the surrounding garden and sea, which will add a substantial depth to any dining experience under the shade of the locally-crafted pergola. Villa Elia also features a built-in barbecue and traditional wood oven in the rear of the compound, backing out into the local vineyards. The breathtaking views, lush surrounding farmland and enchanting sea breeze all combine to create a magical experience in Villa Elia, an amalgamation of modern, traditional design and humble luxury. This villa by the beach in Paros creates an unparalleled atmosphere of revitalization and tranquility that is yours alone to enjoy. All guests are treated with a warm and heartfelt welcome upon their arrival, as well as a bountiful basket of fresh fruits and local Greek fare. Lolantonis itself is a gorgeous stretch of picturesque beach located in the southwest region of Paros. 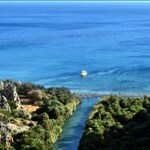 This private yet convenient location is approximately 22km from Parikia and about 19km from Naoussa. Lolantonis beach is one of the few remaining hidden gems that is still unknown to the visitors of Paros, but is an extremely popular destination for the locals of Paros who know the region best, especially among those who live in the southern region of the island. Tradition holds that the beach's name originated from the local Lolantonis tavern that is still next to this beach today. The beach is located inside a small bay that faces to the south, which means that it is generally protected from the strong northern winds of the summer season. The nearby sea is usually calm with no waves, and the thin local sand makes it ideal for children. The water is a crystal-clear turquoise, and the perfect location for water sports. On the beach's left side there are some rocks to explore with snorkel gear, offering more than a single visit's worth of underwater adventure. There is no need for sunbeds or umbrellas on this beach, as you will find plenty of natural shady areas for those who want to stay protected from the sun. On clear days, you can even make out the outline of the nearby island of Ios. Lolantonis beach features two taverns for light meals, and there are superb dining options available in Drios, which is only 2km to the northeast of Lolantonis beach.